For all of your septic tank services,Call our Environment services team to have your septic tanks serviced. 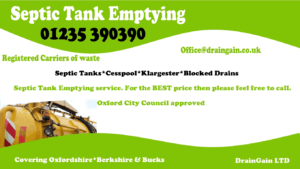 We offer fantastic rates on septic tank emptying, along with a fast and reliable service. Licensed carriers and registered with the Environment Agency. Cesspits emptied and cleaned, cleaning and emptying of cesspits is an important part of the overall service we provide to our customers. Maintenance of your cesspit will extend its life and save money. If you would like to discuss any issues with your Cesspit then why not give us a call and see how we can help. Klargester servicing and maintenance of all types of Kargesters. Call our experienced team to discuss the servicing of your Klargester. Regular cleaning, de sludge of these units is imperative again to ensure its performance and extend its life. Please feel free to contact us to discuss any issues you may have. There are many different terms people use for having there septic tank emptied, these include septic tank pumping, septic tank cleaning. What is important is septic tank maintenance of septic tank servicing as some choose to call it. Regular emptying of your septic tank will prolong its life. With over 25 years in waste water services then you are in safe hands with us. Rest assured we will be with you all the way with round the clock 24 hour service. Call the the Trusted name Drain Gain.